Christmas In The City - with all the hustle and bustle, this series captures the elegance and excitement of the city. A highly detailed replica of St. Paul’s in Manhattan, New York. Christmas In The City - with all the hustle and bustle, this series captures the elegance and excitement of the city. 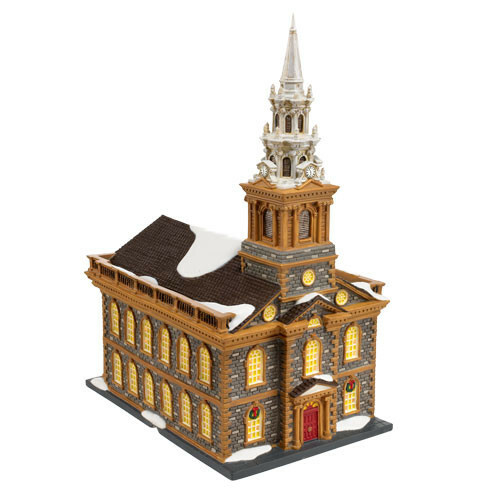 A highly detailed replica of St. Paul’s in Manhattan, New York. Opened in 1766, this colonial church is where George Washington worshiped, most notably for a thanksgiving service after taking the oath of office as the first president of the United States. Located at Broadway and Fulton, adjacent to the World Trade Center site, some have considered it a miracle that the church was not damaged during the attacks of 09/11/01. Following 09/11, St. Paul's Chapel was a place of rest and refuge for recovery workers at ground zero. Hand-crafted and hand-painted porcelain lit building. Designed and manufactured exclusively for Department 56.